I dimensioned a steel construction connection with the add-on module RF-JOINTS and modeled it for comparison in RFEM. Why are the results not identical? 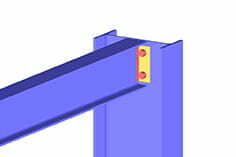 Please note that in RF-JOINTS there is an idealized verification of a steel construction connection according to the standard and this can not be easily compared with an exact FE mesh calculation. Consideration or exclusion of friction / pressure / tension within the contact volume (register "Contact"), as well as with the modeled screws. Consideration of internal forces and deformations within post-modeled end plates or the like, due to which a rearrangement of the screw forces takes place in the FE calculation - in contrast to the idealized proof in RF-JOINTS. 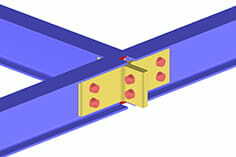 Remedy can be created for example by rigid connection objects (for example, face plate as a rigid surface). Uniform load transfer into the FE model, for example with the help of rigid bars / rigid surfaces, as in the article FEM modeling approach for rigid connections .